Suffolk County District Attorney Timothy D. Sini. Riverhead, NY - October 25, 2018 - Suffolk County District Attorney Timothy D. Sini and members of the District Attorney’s Heroin Task Force, U.S. Immigration and Customs Enforcement’s (ICE) Homeland Security Investigations (HSI), the Suffolk County Sheriff’s Office and the Suffolk County Police Department today announced the unsealing of a 53-count indictment against three individuals in connection with the alleged distribution of narcotics out of a barbershop in Port Jefferson Station. The defendants allegedly sold narcotics, including fentanyl, heroin and cocaine, out of the Man Cave Barbershop, located at 1125 Route 112. Juan Lopez-Enriquez a/k/a Willy, 41, of Coram, is charged with two counts of Criminal Sale of a Controlled Substance in the First Degree, an A-I felony; 12 counts of Criminal Sale of a Controlled Substance in the Second Degree, an A-II felony; two counts of Criminal Sale of a Controlled Substance in the Third Degree, a B felony; 32 counts of Criminal Possession of a Controlled Substance in the Third Degree, a B felony; Criminal Possession of a Weapon in the Second Degree, a C violent felony; Criminal Possession of a Firearm, an E felony; and three counts of Criminally Using Drug Paraphernalia in the Second Degree, an A misdemeanor. If convicted of the top count, he faces a maximum sentence of eight to 20 years in prison. Santiago Tavarez a/k/a Jose Rosado a/k/a Old Man, 64, of Rocky Point, is charged with Criminal Sale of a Controlled Substance in the First Degree, an A-I felony; two counts of Criminal Sale of a Controlled Substance in the Second Degree, an A-II felony; and six counts of Criminal Possession of a Controlled Substance in the Third Degree, a B felony. If convicted of the top count, he faces a maximum sentence of eight to 20 years in prison. Carlos Encarnacion, 33, of Port Jefferson Station, is charged with two counts of Criminal Sale of a Controlled Substance in the Second Degree, an A-II felony, and four counts of Criminal Possession of a Controlled Substance in the Third Degree, a B felony. If convicted, he faces a maximum sentence of three to 10 years in prison. The investigation into the alleged distribution of narcotics at the Man Cave Barbershop began in January 2018 and involved several investigative techniques, including the use of physical surveillance and electronic surveillance. Lopez-Enriquez, who is a manager and barber at the Man Cave Barbershop, is alleged to have coordinated the sale of narcotics out of the establishment. Encarnacion, who is an employee of the barbershop, and Tavarez, who frequented the shop on a social basis, were allegedly involved in the narcotics sales. The investigation revealed evidence that the defendants sold approximately one kilogram of narcotics per month, using the barbershop as a hub of the operation. The narcotics included heroin, cocaine, and fentanyl, which the defendants marketed as heroin. The defendants were allegedly making approximately $50,000 in proceeds per month in drug sales. 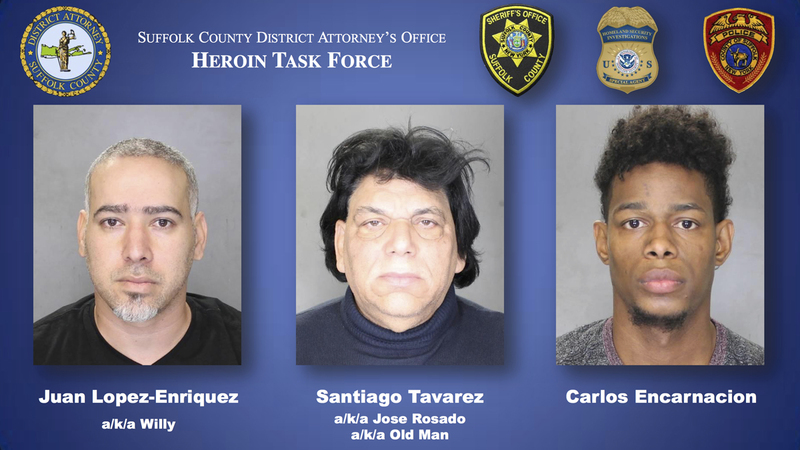 Law enforcement officers from the District Attorney’s Heroin Task Force, the Suffolk County Sheriff’s Office, HSI and the Suffolk County Police Department executed search warrants on October 4 at locations affiliated with the defendants, including the Man Cave Barbershop. The search warrants resulted in the seizure of a loaded semiautomatic handgun; a box containing 38 cartridges of ammunition; a hydraulic kilo press; two scales; packaging materials; approximately 20 grams of cocaine; and approximately 200 grams of powder cutting agent, which is used to dilute narcotics to make them more profitable. Lopez-Enriquez, Tavares and Encarnacion were arraigned on the indictment today in front of Suffolk County Supreme Court Justice Martin I. Efman. Bail was set for Lopez-Enriquez at $250,000 cash or $500,000 bond. Bail was set for Tavarez at $200,000 or $400,000 bond. Bail was set for Encarnacion at $100,000 cash or $200,000 bond. This case is being prosecuted by Assistant District Attorney Jacob Kubetz, of the Enhanced Prosecution Bureau’s Electronic Surveillance Unit. 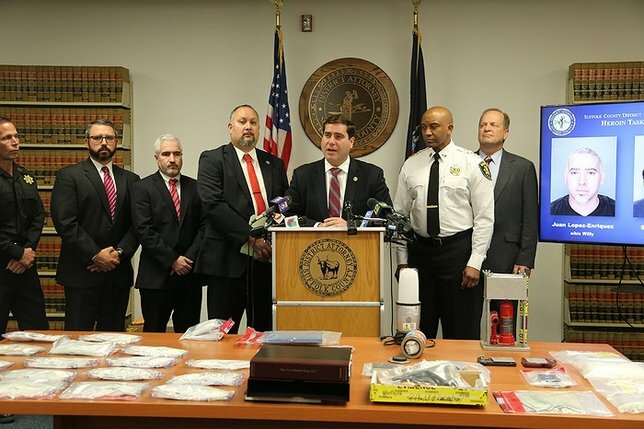 The Suffolk County District Attorney’s Heroin Task Force comprises nine law enforcement officers from the District Attorney’s Office, Suffolk County Sheriff’s Office, Suffolk County Police Department and Northport Village Police Department. Subject: LongIsland.com - Your Name sent you Article details of "DA Sini and SCPD Announce 53-Count Indictment in Connection with Alleged Drug Operation in Port Jefferson Station Barbershop"